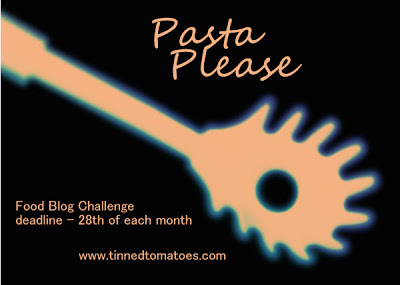 I’m excited to share with you that Jacqueline from Tinned Tomatoes has asked me to guest host the Pasta Please challenge this month. I’ve never guest hosted a challenge before so I am quite excited. I ummed-and-arred about what “theme” I could set for the challenge and have finally settled on seasonal veggies. If you want to take part in this month’s challenge read on! As the dark nights draw in and the days get cooler I get so excited: I love warm snuggly jumpers, splashing in puddles and hearty pies! It also means Halloween, Bonfire Night and Christmas are all just round the corner! As I am hosting the October edition of Pasta Please, I thought I would pay homage to my favourite time of year with a celebration of seasonal produce. Just think harvest festival! Aubergine, apples, beetroot, broccoli, brussels sprouts, butternut squash, carrots, celeriac, celery, chestnuts, chicory, chilies, courgette, kale, leeks, marrow, onions, parsnips, pears, peas, pumpkin, radishes, rocket, runner beans, spinach, swede, sweetcorn, swiss chard, tomatoes, turnips, watercress, wild mushrooms and winter squash. Have you decided what to make yet? A few of those ingredients have caught my eye… To join in just follow the guidelines below. If you use twitter, tweet your post with @KitchenGoddess3 and @tinnedtoms and #PastaPlease and we will re-tweet it. Only one entry per blog. Bonus tip: If your entry happens to be vegetarian then you can link it up with Jacqueline’s brand new Meat Free Mondays linky as well. So, now you know how to take part all you have to do is get cooking! Jacqueline and I look forward to seeing all of your recipes.